When composing your content on the Stage, gridlines can be handy for a proper layout of your graphical and text objects. Moovly has a Grid option that you can switch on when needed. The gridlines will not be visible in your final, rendered video. Furthermore, the 'snap to grid' option allows you to perfectly position, distribute or align objects on perfect horizontal and vertical lines. How to switch on the Grid? 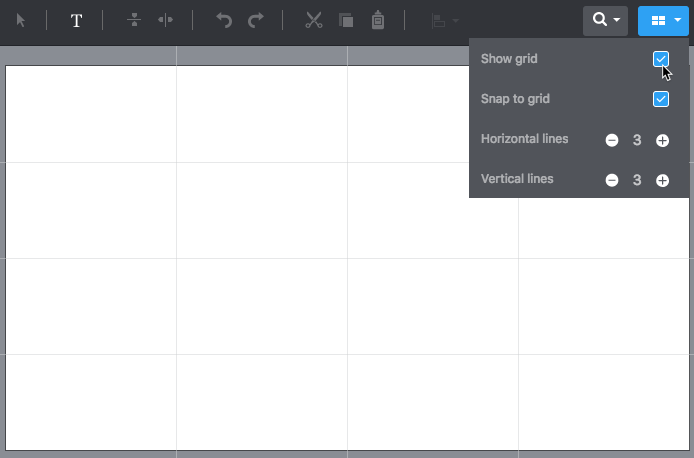 Tick the "Snap to grid" option to have your objects automatically snap to the gridlines when you reposition them. You will feel the "gravity" of these lines as you move the edges or center of you object near these gridlines. To turn off the grid function, just click the Grid icon once more - it returns to gray and the grid disappears. How to align objects with each other on the Stage?